Recycling of business is found to be much in demand today in India. It is a technique of ‘making the best out of waste’. In this regard, you could consider starting the business of recycling tyres. This offers you a good amount of profit. There are however, certain requirements to start the same. A thorough research is important to start the business, in order to reduce unexpected losses. The equipment which is required to be used for the recycling of tyres should be the first step of inquiry. Not only this cost, but also the materials which get into the process of recycling of tyres should be checked and kept ready. Plan the cost of the said items and also make sure you link up with the waste management authority and get more information about the different sources of supply of tyres. Do not forget to include the building cost in the plan along with the amount payable to the staff employed. Getting into an agreement with the local vendors for transportation of tyres from the sources will reduce the cost of production. Provide safety measures to your employees as well as per the authority’s guidelines. Finance is the heart of any business. Contact the banks for the same and zero down on the repayment aspects by concentrating of funding which involves less interest rate. The basic requirement of a business is that, its contacts should be strong. Hence, look into the best of the dealers to get orders. Heavy industries would require oil or fuel produced from the recycling of the tyres. So here is a choice for you to select them! You can get the best prices if you are able to convince on the recycled product delivered at the cost lower than the other vendors. Margin of profits could be such that it compensates the cost involved in the business. There is a specific authority appointed to assist you in starring the above mentioned business. License for the same has to be obtained and registered. Once you do that you can concentrate on other aspects of business. Make sure you hire and speak to an experienced lawyer before you undertake this step. Firstly, the location where the plant for recycling business has to be started must be decided. This enables you to know the factors of pros and cons of that locality. Do look into the same to restore the plan as required. This is an important aspect of business as it is the main revenue area. Usually, it is seen that the factory for setting up of the recycling of tyres are started in a faraway place from the residential area. This is because the process creates a lot of noise pollution.You can also sell the tyres for cash to the people who live near the plant. There are many who look for setting the swing tyres at their home! Grab the source to start up with yours! Make a note of business houses which are into dealing of tyres and make an agreement with them for acquiring of tyres from them. The cost involved in transporting tyres from the dealers can be done for an agreed price or you can appoint a person from your end for the same. You could also collect the tyres for free transport from the source accordingly. The industries would get in touch with the tyres recyclers to get or fuel for their production unit. Hence, be ready for the orders! To get the orders you have to inform the industries about your existence and also understand the company’s requirement. Do no overtake their buying policies by giving them unrealistic discounts. Do a small survey of the amount of deals offered to other vendors by checking their rates on internet or meeting the concerned vendor accordingly. You will have a fair idea about quoting your price eventually getting the deal successful. Maintain the punctuality in delivering the proceeds so that the relations with the company you are dealing with do not get effected. To be in the market, you have to research the same every now and then in order to get updated. 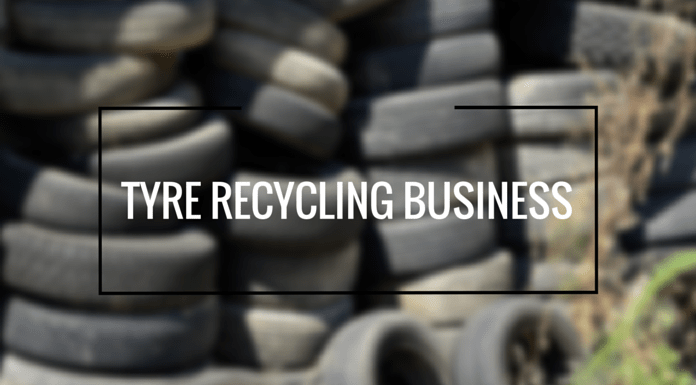 Overall, the business of recycling of tyres is in great demand and the right aspect of search related to the would assist you in gaining success in this field. Giving the most effective strategies like the selection of sources and supply makes the difference in standing unique in the market for long! We are interested to start a recycling unit in north india. We are looking forward to some assistance (technically) and also will be a add on if we can get some guidance on the Financial. I am also interested about this matter…. India is not in the picture as I still have not found any statistics of reusing the tyre/cured rubber product waste where US leads the market with approx 90% reusing of tyre waste…. RMA stats show that by 2017-20 India’s automobile sector will flourish and so a huge market is going to rise in scrap and waste tyres but its recycling is still not accounted….. I don’t know exactly it is right or wrong but there is a profitable market in this business…. or call 0091-9004077349 it also has whatsapp. Recycling is the good bussiness we have interested but we need assist and support .how to start. How much invest money. Where can get machinery and all details.please send. I want to be a supplier of waste tyre to the tyre recycling unit kindly impart me your valuable suggestion at my email regarding supply of waste tyre to the recycling unit, what are my basic formalities to complete before supplying tires to the unit and profitability in this business. I m tushar from Maharashtra, i m gonna start waste tyre recyle factory, i met gulf rubber factory at Dubai regarding waste tyre recycle, but i want to know which recycle machine is good/latest in india for recycle. I want to be a supplier of waste tyre to the tyre recycling unit kindly impart me your valuable suggestion at my email regarding supply of waste tyre to the recycling unit, what are my basic formalities to complete before supplying tires to the unit and profitability in this business.can you please support me ? i would like o start a tyre recycling plant in india , can you please guide me in right way ? I’m from India- Nagaland and I would like to start a busines of supplying of old tyres to the Recycling Company in India but does not have any knowledge of where and how …. So Sir,if you’l kindly help me out regarding this ….please contact me in my email for your help. Recycling is the good bussiness we have interested but we need assist and support. how to start. How much invest money. Where can get machinery and all details.please send and this factory possible in Gujarat state. Gujarat government gives permission to build factory. Another government gives permission. So Sir,if you’l kindly help me out regarding this ….please contact me in my email for your help. I would like to Start the recycling of tyre business in Gujarat. I would like to get consultancy of the same and need Basic structure of the business if thats possible. The add on benefit would be getting the Technical person as well. Please if i can get some help for the same. We are big whole seller of car tyres in UK and Germany. Now we have good collection of old and scrap tyres. Please if someone guide us how we can export them to India and which type of customers we should target. Recycling is the good business we have interested but we need assist and support. how to start. How much invest money. Where can get machinery and all details.please send and this factory possible in Telugu states (Telangana Or Andhra Pradesh ). Is Telugu state governments gives permission to build factory ? I would like to start this business in Trinidad, I have been very interested in the recycling of old tires for some time now.